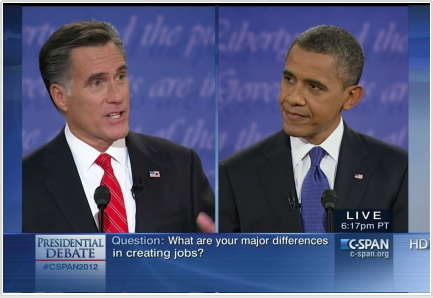 As Disease Management Care Blog Twitter followers know, the recent Presidential debate certainly captured its attention. Yet, while other "#debate" tweets focused on policy one-liners and short political insights, the DMCB was discovering the twin medical conditions of hyperblepharokinesis (Mr. Romney's rapid fire blinking) and bradyblinkosis (Mr. Obama's sullen slow blinks). Conhomie: the pseudo-bonhomie manifested by a warm handshake and smiling embrace by two individuals who really detest each other. HannibalLectern: what a debater afflicted with conhomie stands behind while he secretly wishes he could rip out the liver of his opponent. Ropadebateadope: an inability to answer simple questions posed by a debate moderator. Lehrerosis: the sudden onset of muteness caused by the excessive blabbering of another person. 90-billionate: using a previously unknown, unused and untrue statistic to undermine an opponent. Denver Fever: a life-threatening triad of hyperventilation, anxiety and sputtering precipitated by the underperformance of a favored debater. Also known as the "MSNBC Vapors." Obamaprize: the nasty surprise experienced by sitting Presidents who underestimate a political enemy. Romneyize: overwhelming an opponent with a barrage of lies, damned lies and statistics. The DMCB looks forward to the next one.